The acting Director-General and Chief Executive Officer, Standard Organisation of Nigeria, SON, Dr. Paul Angya, has sought the assistance of the Economic and Financial Crimes Commission, EFCC, in tackling the menace of sub-standard products in the country. Speaking during a courtesy call on the acting Chairman of EFCC, Ibrahim Magu, on Wednesday, Angya said that “it has been on our minds to pay you a visit to solicit for your support, since we took over the leadership of the SON. Meanwhile, Magu has expressed the readiness of the Commission to offer the required training to enhance the operations of the Fiscal Responsibility Commission, FRC. He gave the assurance when he received a delegation led by the Chairman, Fiscal Responsibility Commission, FRC, Victor Muruako, in his office. 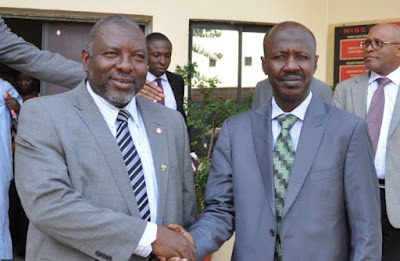 Magu, who thanked the delegation for the visit, added that the EFCC had a world-class Academy and resource persons to aid the operations of the FRC. Earlier in his remark, Muruako expressed the need for a partnership with the EFCC in eradicating economic and financial crimes among revenue generating agencies. According to him, “Fiscal Responsibility Commission always has to force these revenue generating agencies to submit their annual statements of account. The FRC boss pleaded with Magu to assist in the training of his staff to gain the required knowledge in creating more awareness about the operations of the FRC. “The FRC will appreciate the help of the EFCC in facilitating contacts with donor agencies to assist in carrying out its statutory objectives,” he added.